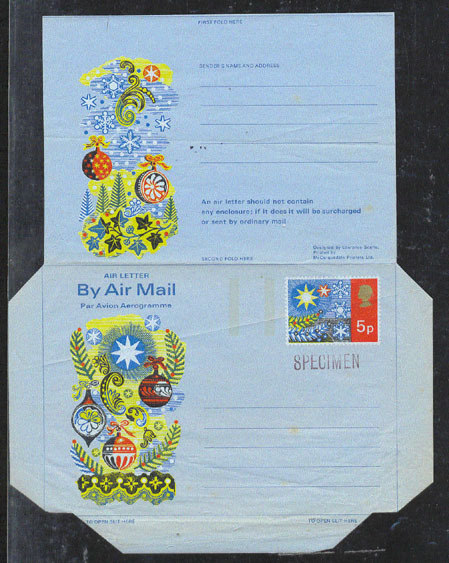 15891 SPE GREAT BRITAIN (1973) Christmas ornaments*. 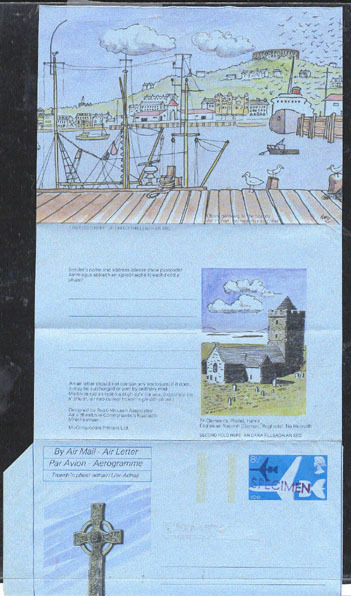 5p Aerogramme overprinted SPECIMEN below value. Text in English. 15957 SPE GREAT BRITAIN (1973) Woman in costume*. Village scene*. 5p Aerogramme overprinted SPECIMEN and "VOID" below value. Text in English and Welsh. 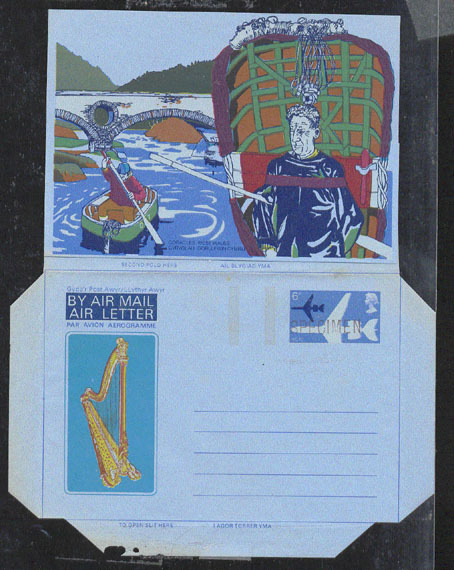 16747 SPE GREAT BRITAIN (1974) Harp*. Coracles of West Wales*. Bridge*. 6p Aerogramme overprinted SPECIMEN and "VOID" below value. Text in English and Welsh. 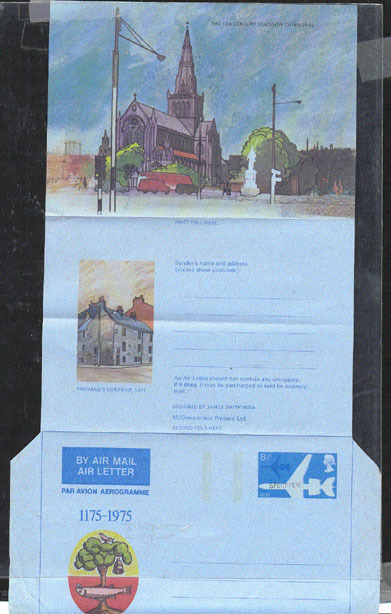 15224 SPE GREAT BRITAIN (1975) 13th Century Glasgow Cathedral*. Fish*. Tree*. Bird*. Bell*. 8-1/2p Aerogramme overprinted SPECIMEN and "VOID" below value. Text in English. 800th anniversary of Glasgow. 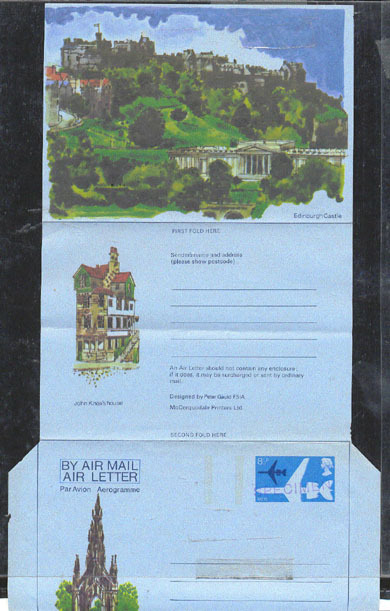 15822 SPE GREAT BRITAIN (1975) Edinburgh castle*. Scott Monument*. John Knox's House*. 8-1/2p Aerogramme overprinted SPECIMEN and "VOID" below value. Text in English. 16977 SPE GREAT BRITAIN (1975) Kildalton Cross*. Oban Harbour*. St. Clement's*. 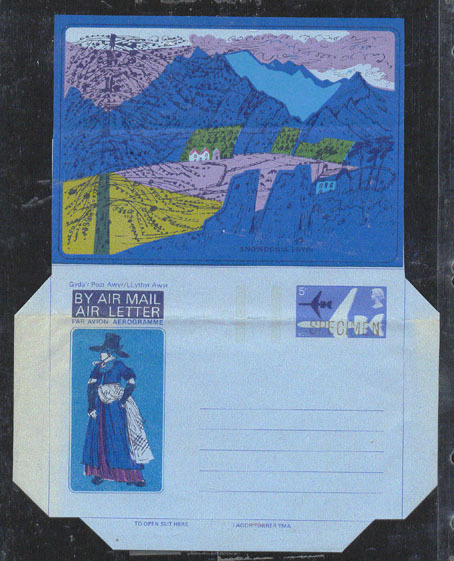 8-1/2p Aerogramme overprinted SPECIMEN and "VOID" below value. Text in English and Gaelic.